A steel vault in your back pocket. The mighty U lock has long been the top choice for securing bikes due to its simple design, solid materials, and immobile parts. Abus contributes to the market with a streamlined, German approach and advanced engineering to offer the lightweight yet reliable Granit Plus 640 U-Lock (9 Inch). This lock is lighter and stronger than its predecessor thanks to a 12 mm-thick (0.47 in) hardened steel shackle, increasing its security rating to a 12 on Abus's 1-15 scale. 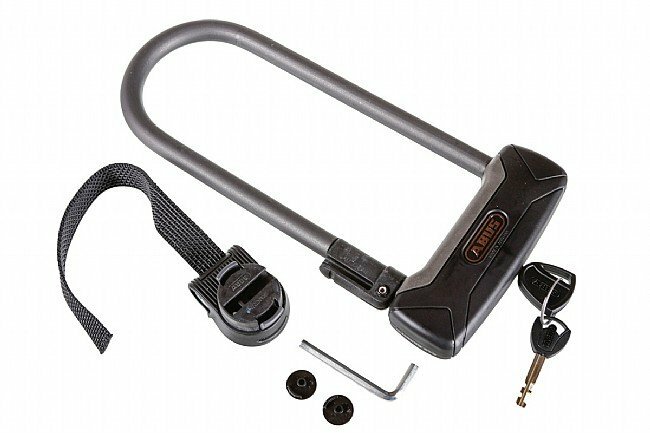 This 9 Inch version of the Granit Plus 640 U-Lock is great for high theft risk areas or added security on a high-quality bike with quick-release that requires a little more length than the 6 inch version. Weight: 1123 g (2.5 lb). Includes two keys and Abus Code Card for an additional replacement key.